One of the greatest stories not just in American racing history, but motorsports history in general is the saga behind the development and success of the Shelby Cobra. 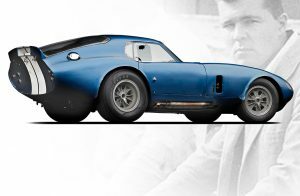 Even more amazing than that is the story of the world-conquering Cobra Daytona coupes. And even among the rarified air of the six original Daytona coupes, one car’s story stands head and shoulders above the rest - the story of the first car, chassis number CSX2287. From the very beginning, CSX2287 was special. 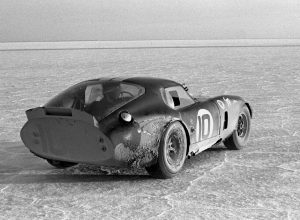 Not only was it the first Daytona coupe built, this particular car was the only one built at Shelby’s Venice Beach, California skunkworks. All the rest of these American racing legends were built at Carrozzeria Gransport in Italy. On its racing debut at the 1964 Daytona Continental 2000km event, it immediately set the pace in practice sessions in the hands of Ken Miles before becoming the subject of a photograph that remains famous to this day. Co-driver Bob Holbert pulled the Viking Blue Daytona coupe into the pits mid-race for a differential oil change, and despite refueling just a few laps earlier, team owner Carroll Shelby ordered the fuel to be topped off as well. Without an overflow tank, the full tank backed up and splashed over the still-hot rear brakes, and the car ignited almost instantly. 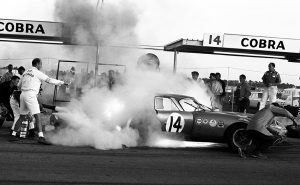 The fire was quickly put out, and mechanics suffered only superficial burns, but the flare-up was captured in stark black and white by a track photographer as a famous reminder of the dangers of the sport. Although mechanics assured him that the car could easily be repaired, Shelby, wanting to distance himself from the callousness of other team owners like Enzo Ferrari or Colin Chapman, immediately retired CSX2287 for safety. After the car’s explosive debut, it went on to a class win at the 12 Hours of Sebring that March, driven by Holbert and Dave MacDonald, and set the GT pace at Le Mans that year before a tenth-hour disqualification. 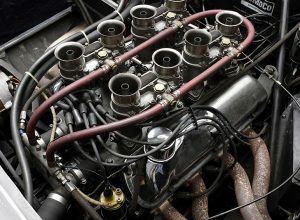 The remainder of its racing career, unfortunately, was beset by mechanical failures, but CSX2287 managed to compete at Reims, Oulton Park, Spa-Francorchamps, and the Tour de France before a final showing at the 1965 24 Hours of Le Mans. During its racing career, the car had been helmed by some of the best drivers of the time, including Phil Hill, Chris Amon, Jo Schlesser, Innes Ireland, Jochen Neerpasch, and Andre Simon. Though it’s sportscar racing days were clearly in its rearview mirror, CSX2287 went on to set 23 closed course speed records at Bonneville in the hands of land speed legend Craig Breedlove; was purchased and driven on the streets of Hollywood by a music icon (now doing life for murder); orphaned when its next owner of 29 years committed suicide; and was finally purchased, restored and put on display for all to enjoy. CSX2287’s life after racing was a sorted tale worthy of a Stephen King novel. Click here for the full story including comments from designer Pete Brock and land speed maven Craig Breedlove. Shelby offered the now $26M Cobra to both Pete and Craig for $800, but they both turned him down.